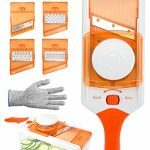 THIS DELUXE SET INCLUDES: Detachable Mandoline Slicer (Orange), Interchangeable Blades, Food Container Base, Safety Hat, Safety Glove and Instruction Manual. EXTRA FEATURES – Soft Grip / Non-Skid Base to Keep Mandoline in Place Whilst Working on Flat Surface; Rotator Lock Keeps Blades Secure. Includes Safety Hat and Glove. Easy to Clean- Simply Rinse Under Running Water or Place in Top Shelf of the Dishwasher. 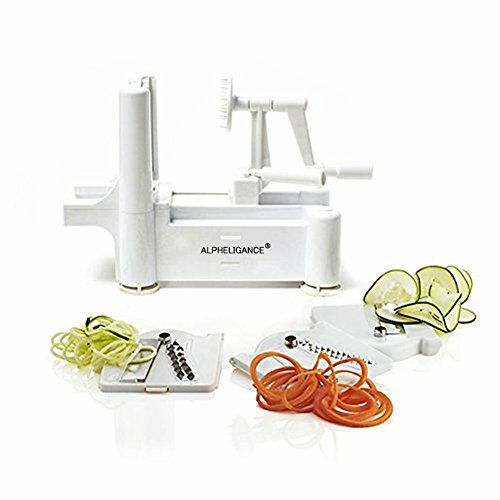 TOP TIP- Use the Julienne Slicer as a Spiralizer (or Tri Blade Slicer) to Create Long Noodle / Spaghetti Shape Vegetables! Create Cool Paste-like Vegetables, Which are Great if Youíre on a Diet or Trying to Feed Your Children! BUY TODAY AND RECEIVE ALL 3 BONUSES IN YOUR FOLLOW UP EMAIL: Mandoline Recipe Ebook, ìThe Best Youî Ebook AND Video Tutorial – Absolutely FREE! Please Note this will be Emailed to You After You Purchase so Please Check Your Amazon Email Inbox for Bonus Material. So What are You Waiting For? 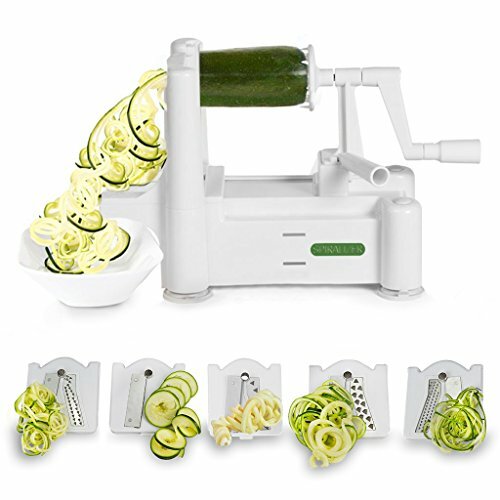 Pick Up the Perfect Spiral Slicer, Vegetable cutter, Vegetable Grater All In One – Today! One of the Best Father’s Day Kitchen Gadgets Gifts from Son, Daughter or Wife Even! WANT TO SAVE TIME SLICING YOUR VEGETABLES, BUT STILL MAINTAIN THAT CONSISTENT CUT? HomeNativeÆ brings you the solution! 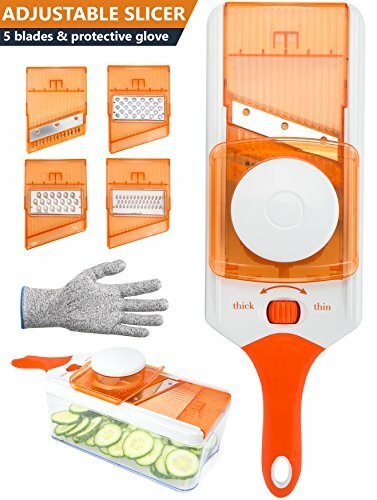 NEW: Adjustable Mandoline Slicer (Orange) – Perfect for Slicing and Dicing a Wide Variety of Fruits and Vegetables! 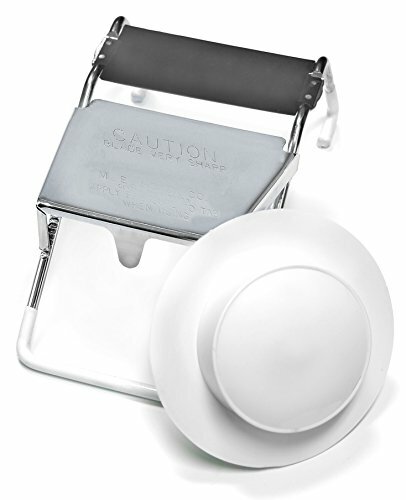 ï Food container base to catch all your cuts! 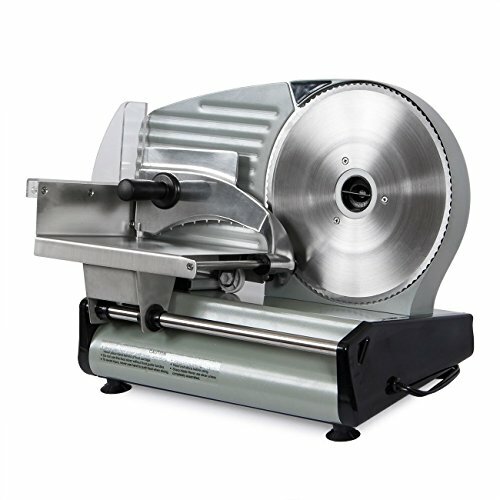 ï Straight slicer – perfect for slicing fresh cucumber or thinly cut potato chips! ï As a precaution we recommend using a cutting glove provided! BUY TODAY and receive BONUS Recipe Ebook, Video Tutorial & The Best You Ebook – absolutely FREE! But HURRY as stocks are selling fast & wonít last! CLICK the Yellow ìAdd to Cartî Button Above to Start Benefitting from this Deluxe Mandoline Slicer! 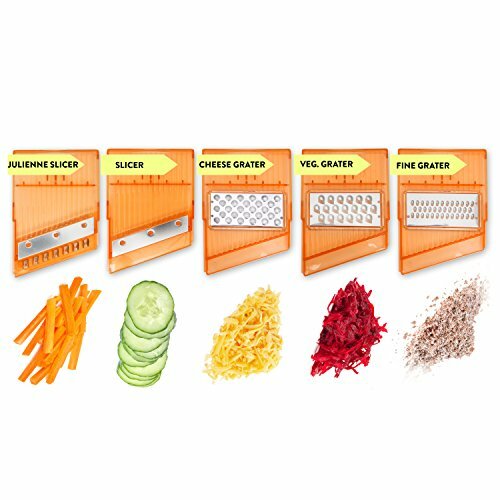 5 STAINLESS STEEL BLADES: Vegetable Slicer, Vegetable Grater, Fine Grater, Coarse Cheese Grater and Julienne Slicer! 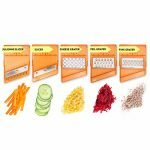 This Multi-Purpose Mandoline Slicer is Excellent for Use as Vegetable Cutter, Vegetable Peeler, Vegetable Chopper, Cheese Grater & Carrot Grater! Want to cut softer vegetables and fruit like a Tomato? Just use a simple zigzag motion! 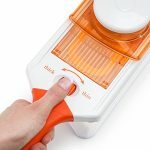 The Mandoline Slicer itself has Three Easily Adjustable Slice Thickness Settings: 1mm, 3mm & 5mm allowing you to create that perfect cut, Every Time!